Johnny Rzeznik’s life wasn’t working out the way he’d planned it. 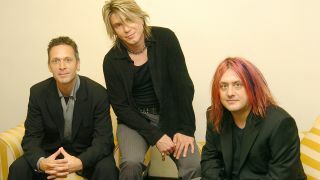 The band he fronted – the Goo Goo Dolls – looked to have peaked with their 1995 hit Name. His confidence as a songwriter was in tatters. Worst of all, the collapse of his marriage had left him living out of a suitcase in a hotel in downtown LA. As always, Rzeznik chose music. On the morning of the day he wrote Iris, the singer had attended an advance screening of City Of Angels – a film whose premise concerned an angel [played by Nicolas Cage] who surrenders his immortality to be with the woman he loves [Meg Ryan]. Rzeznik hadn’t particularly enjoyed the movie, but had his reasons for agreeing to contribute to the soundtrack. Rzeznik recognised Iris as one of his greatest achievements to date. But it wasn’t until he was recording it that he realised how far the song had taken the band from their punk roots. “That was the first time we’d ever been in the studio with strings,” he recalls. “I remember kneeling in front of the control room window, looking out at this 15-piece string ensemble, then looking at Robby [Takac, bassist] and saying: ‘I really think we’re turning a corner here, and I don’t know if I want to’. It was undoubtedly Rzeznik’s ballad that pushed the City Of Angels soundtrack to the top of the US chart in June 1998 and bolstered the band’s own Dizzy Up The Girl album, while the song itself began a five-week run at No.9 in the US. Commercially, the Goo Goo Dolls had arrived. Ultimately Rzeznik chose to embrace his masterpiece. In 2007 it remains the centrepiece of the Goo Goo Dolls’ set-list, the ultimate alt.rock ballad and the singer’s best chance of immortality.